Found a new (to me) author that I want to read more of - Nicola Griffith. I will probably buy this book when the author finishes writing about St. Hilda and all the books are available as a box set/omnibus. Weird bibliphile OCDs, (shrug), I like all the books in a series to match. Hild by Nicola Griffith will be available at Amazon and Barnes and Noble on November 12, 2013. Hild is born into a world in transition. In seventh-century Britain, small kingdoms are merging, usually violently. A new religion is coming ashore; the old gods’ priests are worrying. Edwin of Northumbria plots to become overking of the Angles, ruthlessly using every tool at his disposal: blood, bribery, belief. Hild is the king’s youngest niece. She has the powerful curiosity of a bright child, a will of adamant, and a way of seeing the world—of studying nature, of matching cause with effect, of observing human nature and predicting what will happen next—that can seem uncanny, even supernatural, to those around her. She establishes herself as the king’s seer. And she is indispensable—until she should ever lead the king astray. The stakes are life and death: for Hild, her family, her loved ones, and the increasing numbers who seek the protection of the strange girl who can read the world and see the future. Hild is a young woman at the heart of the violence, subtlety, and mysticism of the early medieval age—all of it brilliantly and accurately evoked by Nicola Griffith’s luminous prose. 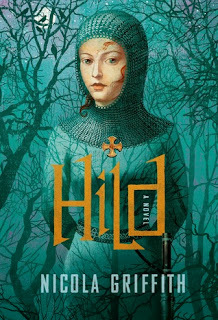 Recalling such feats of historical fiction as Hilary Mantel’s Wolf Hall and Sigrid Undset’s Kristin Lavransdatter, Hild brings a beautiful, brutal world—and one of its most fascinating, pivotal figures, the girl who would become St. Hilda of Whitby—to vivid, absorbing life. Historical imagination. I know almost nothing about St. Hilda of Whitby so this story made for a really unique read for me - a topic that hasn't been beaten to death! That's why I requested a free copy in exchange for review from NetGalley. This story offers a nice combination of history and imagination. I love the author's approach to the character, Hild. She feels fresh, despite living in a stodgy male-dominated world, which emphasizes some of the stereotypes and social concerns that continue to impact the modern world. The author shows both good and bad sides of both the church and government; we see Hild constantly balancing the two powerhouses in order to survive and, because we know that she goes on to found the monastery at Whitby, to help others survive a very harsh world. That being said, this story moves slowly because this book pertains to Hild's childhood and there's not a lot of action happening right in front of the child. It feels like the book ends when the real story is just beginning. There is a sequel planned and I can't wait to read it. The digital version of the book came in at 530-some pages, but this felt like a longer book. The print is small and line spacing tight. I ain't complaining - I wish more eBooks were formatted like this one because the reading experience was more like a real book as opposed to a word document. I have become completely infatuated with historical novels as of late. I think it's a combination of historical facts and the thoughts of the characters. This one will certainly go on my reading list. I enjoyed this book but I really want the next book to be released. To me, it felt like the book ended when the story was just starting. And I hate waiting! I usually like historical novels so I'm probably biased!